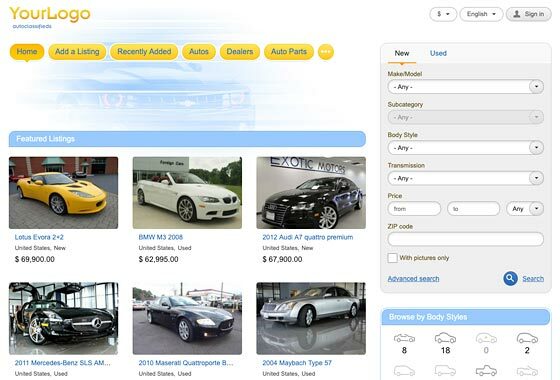 Flynax Auto Classifieds and Car Dealership Software is a complete and flexible solution for starting successful used car and car dealer websites boosted with iOS and Android Applications and offering fully responsive car themes, powerful functionality, a number of plugins and a variety of monetization options. Start your own used car and dealer business with Flynax today! 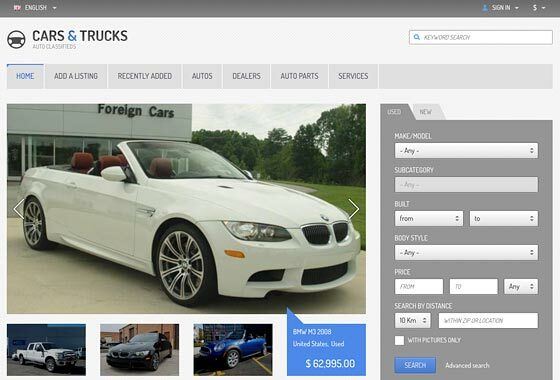 Whether you offer car, truck, or bike classifieds you can always build a tabbed search form with fields specific to a vehicle type. 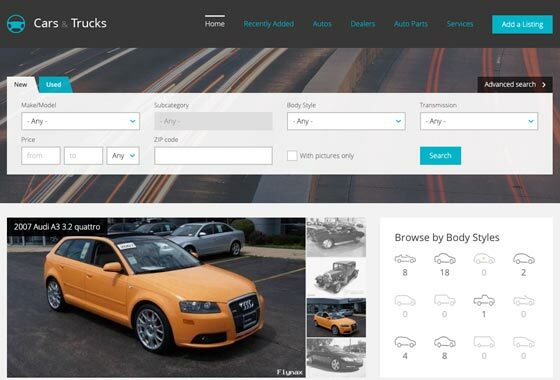 A box with the most popular body styles that allows users to browse through all cars of a body style selected with one click. 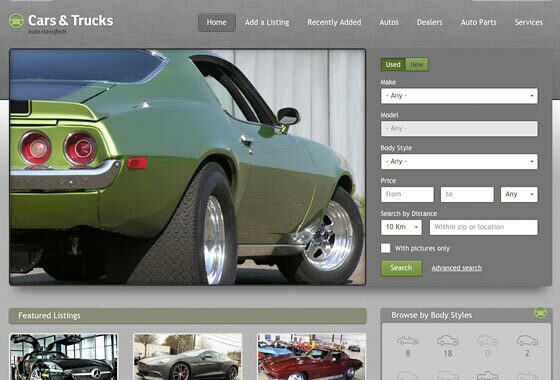 Our auto classifieds script comes with a full database of the most popular makes and models, which you can easily update. With Carfax service your users can view the most accurate and full reports about US cars they're planning to buy by entering VIN codes. 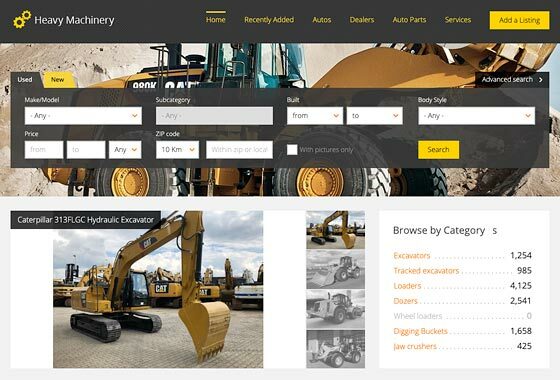 You can always add more vehicle types to your used car site like trucks, bikes, or start a heavy machinery site using our special free patch. Using more than a dozen of payment gateways you can charge users for posting cars, banners, featured cars and even send invoices. You can always boost your site with powerful plugins related specifically to auto classifieds script. Searches for cars within a specific radius based on a zip code. Adding cars to site by entering car plates or VINs can be really fast. 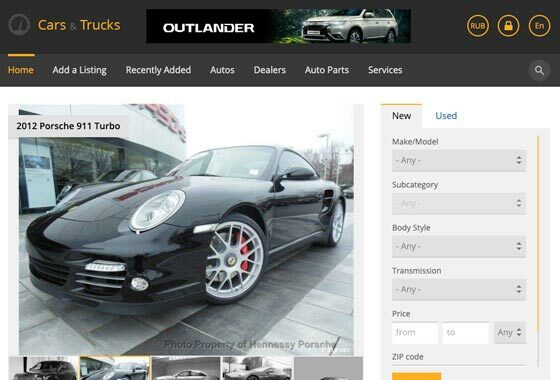 Users can filter car classifieds on listing types and search results. 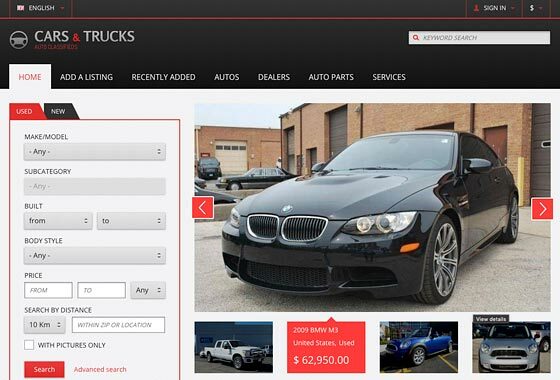 Populate your used car site with listings using our powerful Plugin. Keep users interested by offering them similar cars on details. Let your users compare a few cars online and make the best choice. Users can convert prices into more than sixty world currencies. Putting cars up for auction car dealers will get the best prices.